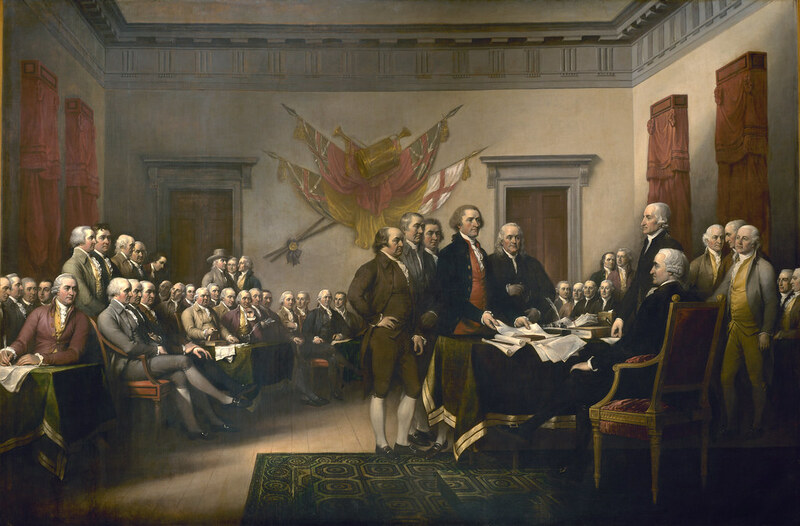 The painting depicts the presentation of the draft of the Declaration of Independence to John Hancock, then President of the Second Continental Congress (1775-1777) by Thomas Jefferson, John Adams, and Benjamin Franklin, who were given by the task of writing the Declaration. John Trumbull (1756-1843) was born in the Colony of Connecticut, where his father was the Crown-appointed Governor and the only Royal Governor to support Independence for the Colonies. Using his family's close ties to England, Trumbull studied and worked in the London studio of the British portraitist Benjamin West. While in Europe he painted the portraits of John Adams, serving as the Ambassador to England at the time, and Benjamin Franklin and Thomas Jefferson, who were both Ambassadors to the French Court. These portraits would later be incorporated into The Declaration of Independence. The scale and multi-figural nature of the painting are ambitious. There are 47 portraits, all done from life. The painting itself was made over a period of three years. However, Trumbull, in his career as a portraitist in the Colonies, had gathered many of the portraits over f decades and brought together his sketches for this piece. A key to the painting with the name of each figure. The painting was later used as the back of the two-dollar bill. United States Currency. Two-Dollar Bill. But, because Congress had only commissioned four paintings, the last four were sent or sold to other institutions.